Models as I like to call it took three years to develop. 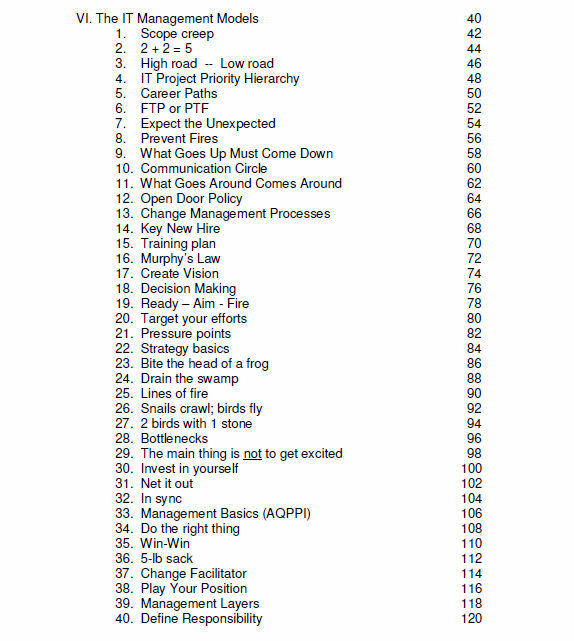 It is a unique book containing 72 models to help managers learn about, discuss, and remember management concepts and issues easily. Models is a truly unique book. The approach taken in this book is unlike any other you have read. It is 200 pages long but the reading will be quick and enjoyable. The models themselves make the book different and interesting to learn. 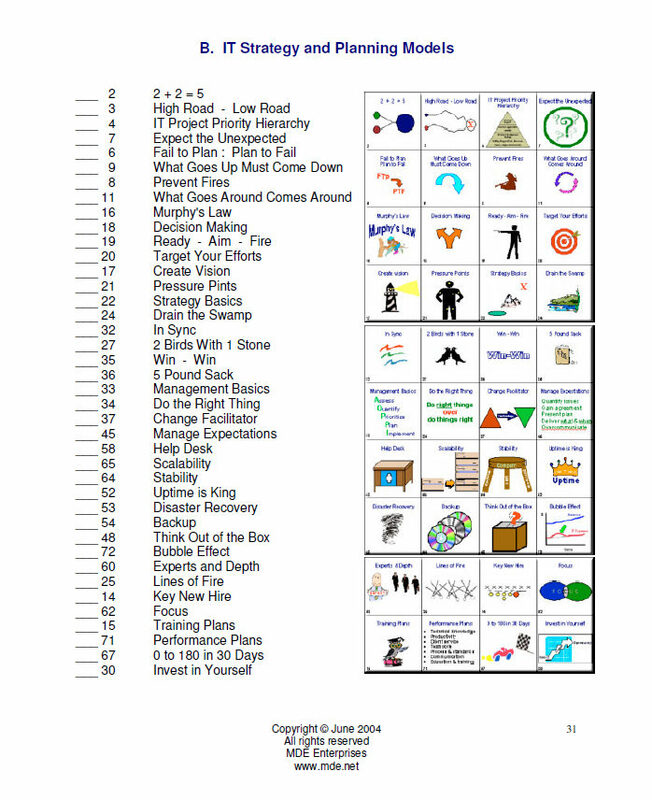 They will also be extremely easy to remember and to use in your day to day activities. 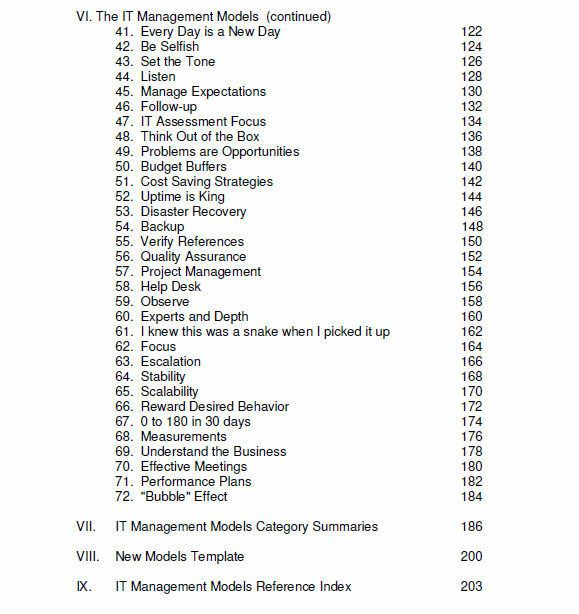 In fact, one of my reviewers of the book said he, “used three models in one day while reviewing the book”. 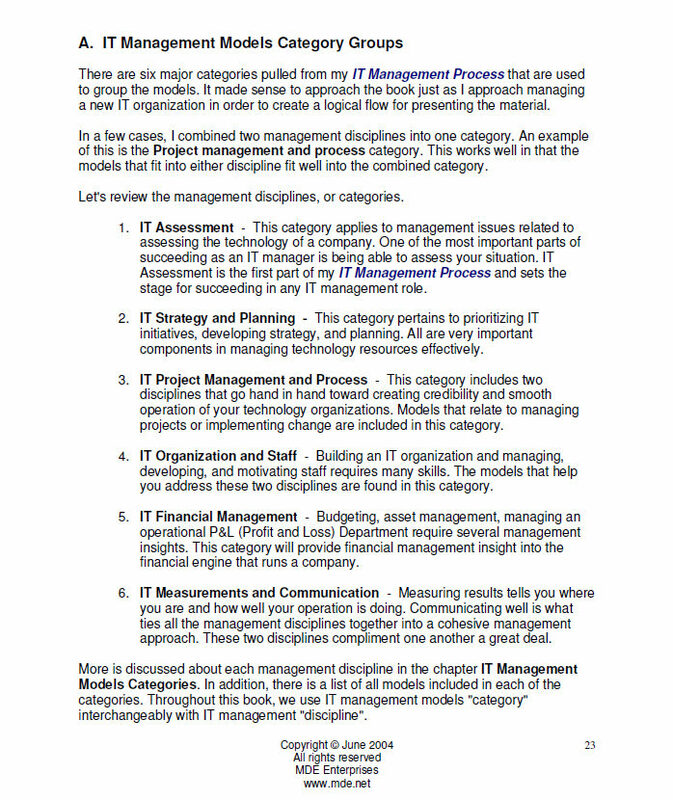 Using models in your IT management or project management activities is a natural thing to do. “A picture says a thousand words.”, they say. 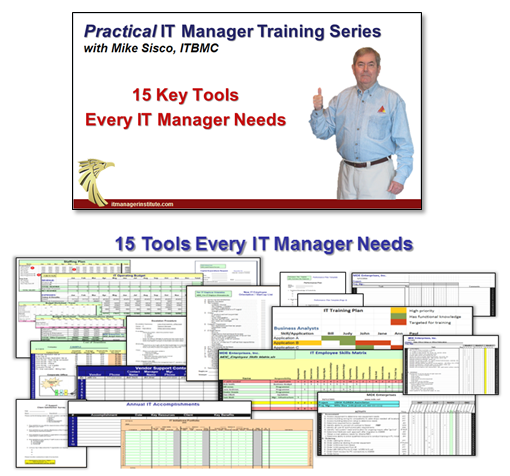 I’ve used models my entire career and now there is an entire set designed specifically for the technology manager or project manager to use in helping you achieve more success. Models is a fun book. Managing technology is hard work and full of stress. We all need to view our problems from a “lighter side” at times. 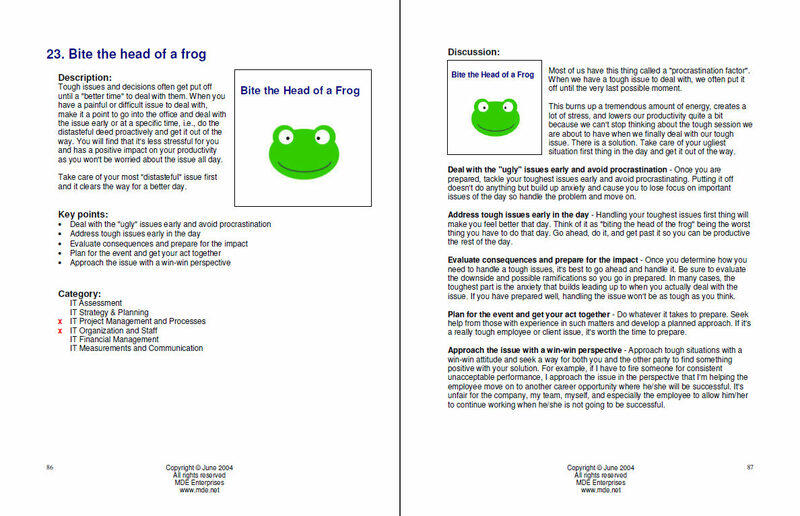 Some of the models like Bite the head of a frog provide a meaningful management principle and insight while taking a more fun approach to the situation. Believe me, when you read about this model, you won’t forget it for a long time and you will be amazed at how easy it will be to use the model in daily situations. Focusing on the model can actually help you defuse a tense situation while getting your coaching message across. Models is a practical book. 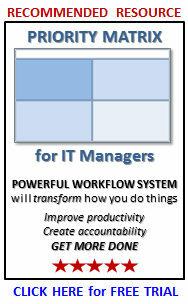 All of my work approaches IT management and project management from a very practical perspective. 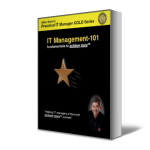 The job of managing technology resources is complex to be sure but managing doesn’t have to be hard and complex when you know what to do, how to go about it, and have the tools to be successful. 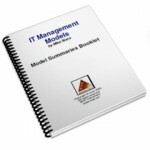 Models is the fourteenth book of my IT Manager Series publications and an excellent tool to help simplify managing technology resources to allow you to achieve more success. Who is Models intended for? 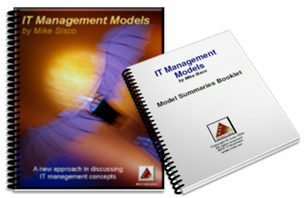 Models is primarily intended for IT managers of all levels, project managers, team leaders, and supervisors. However, it is a tool that can be understood and used by virtually anyone. Good question. 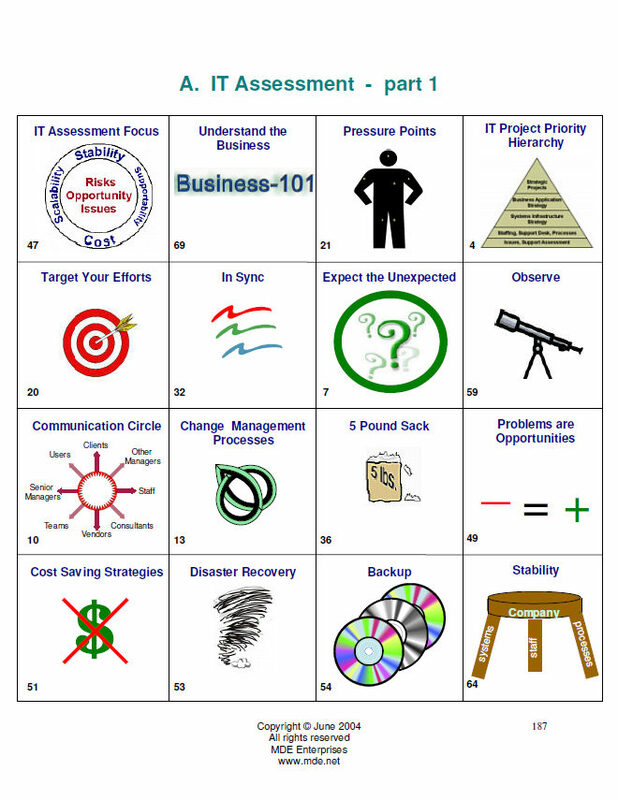 A model starts with a picture or simple graphic used to depict a specific management principle or issue. There are 72 models in the book. 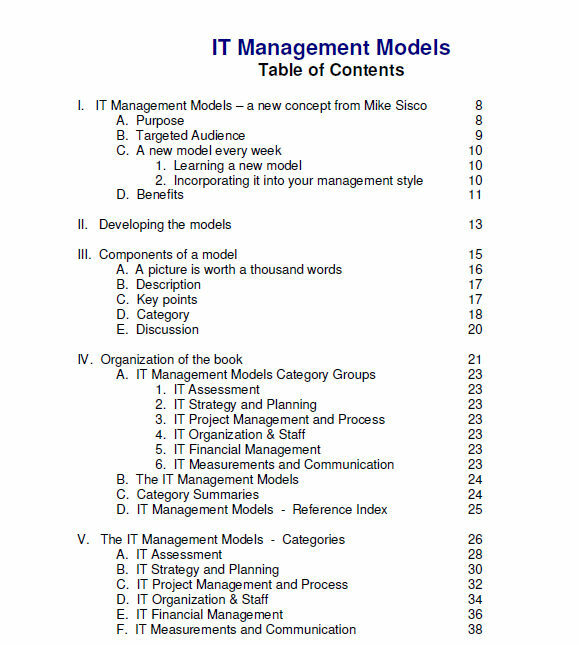 Each model has a unique graphic, a brief description, and bullet points that highlight key points of the model. 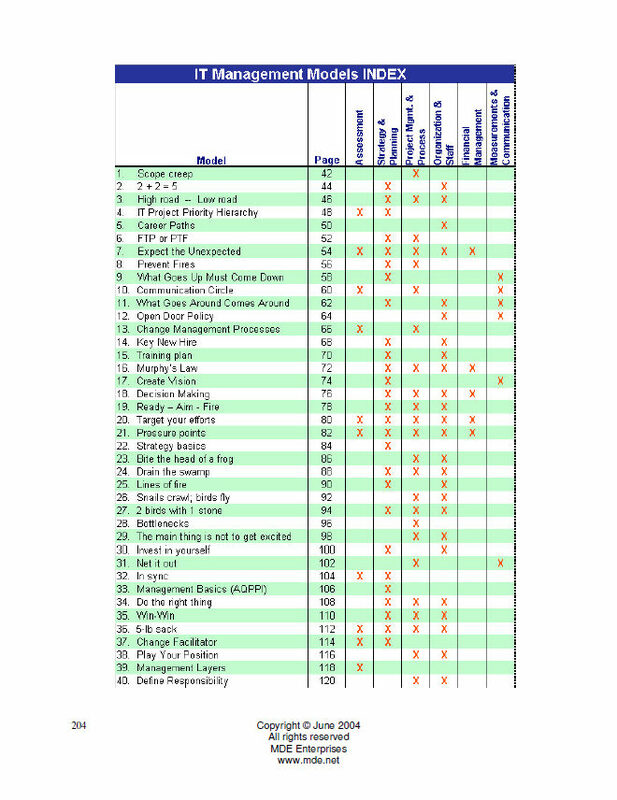 In addition, there is a full page discussion of the model that explains each of the key points. 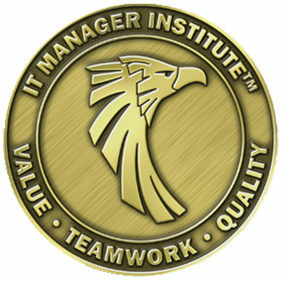 The models cover a complete overview of the requirements of an IT manager, delve into components of project management, and focus specifically on issues pertinent to information technology. 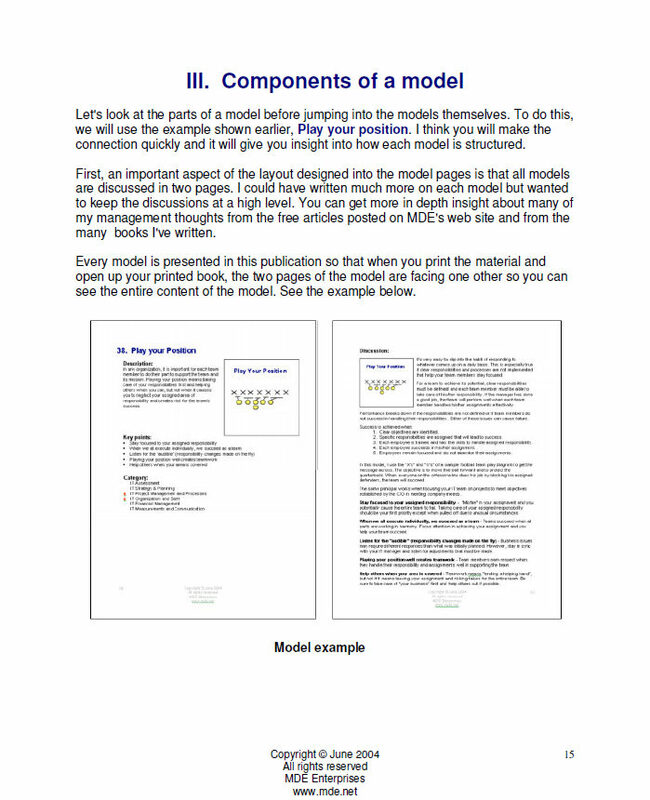 You don’t want to carry a 200-page book around with you so we provide a 2nd e-book document called Model Summaries Booklet that is smaller and can be printed to be carried with you easily for quick reference.